GerritForge plugin integrates your Git commits and Gerrit Code-Review change-sets into IBM Rational Team Concert environment. Work items are automatically linked to your changes through a Git commit message syntax; consistency is assured with work-items assiment and Git commit author. Optionally enforce your policies by making the work-item association mandatory and thus rejecting commits that are either not associated or assigned to the wrong person or in the work status. GerritForge plugs seamlessly into the IBM Rational Team Concert and allows to trigger the work-items workflow actions associated to the Gerrit Code Review cycle. Issue tracking transition are checked in order to assure that only when issue is authorised to switch state the Gerrit submit operation is enabled, allowing a more strict control over the Enterprise policies. CollabNet®, CollabNet TeamForge®, TeamForge™ are trademarks or registered trademarks of CollabNet, Inc. or its licensors in the United States and other countries. Atlassian®, JIRA® are registered trademarks of Atlassian. 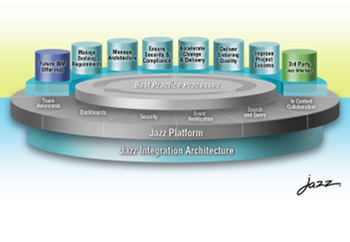 IBM Rational Team Concert®, Jazz® are registered trademarks of IBM. GerritForge™ is a trademark of GerritForge LLP and its associated LMIT Ltd, Louis Urban Ltd.